Ahoy, Ship of the Potomac! What does a chunk of coral from the Caribbean Sea, a brick sidewalk, two outhouses, and a 200-year old ship have in common? They were all found in the recent excavation for the parking garage of the Indigo Hotel in Alexandria, Va. At one point these items were above the waterline of the Potomac River. However, a few decades after the city of Alexandria was founded in 1749, the riverfront landowner wanted to increase his property so he did something that was pretty common back then, he just filled in the river bank. Known as “banking out”, the landowner sometimes scuttles, or sinks, an old ship in the spot to help contain the new materials added to the riverbed. That is believed to the be the case for the 50-foot ship fragment found in this soon-to-be parking garage. The ship was painstakingly excavated from the pit in January 2016 by Thunderbird Archaeology. The wood needed to stay wet to prevent additional deterioration so the pieces were placed in large water tanks in a city facility for storage and protection. Little is known about the actual ship. Researchers are hoping that its restoration will unveil some of its secrets, including its construction, history, and possibly even the crew. 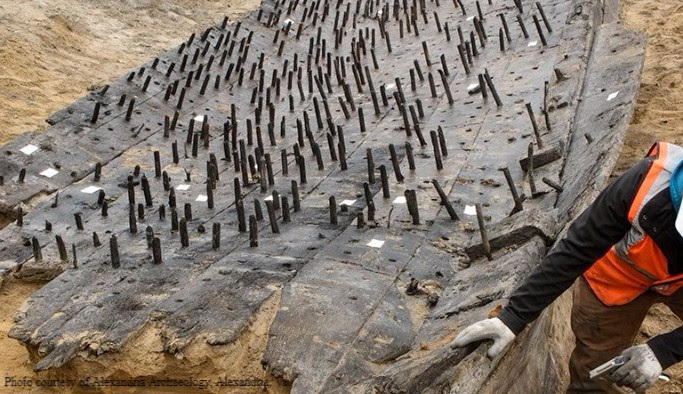 Preliminary research has revealed that the ship’s timber was felled in the state of Massachusetts sometime after 1741. 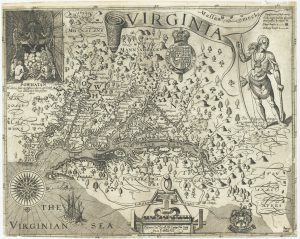 Based on historic maps, it is thought that the ship was buried on the Potomac shoreline between 1788 and 1798, along with sand, rocks and other debris. After requesting proposals from professional conservationists around the world, the City of Alexandria’s Archaeology Department put the ship into the hands of experts at Texas A&M University’s Center for Maritime Archaeology and Conservation (TAMU). In preparation for its cross-country voyage, each beam of the ship was meticulously documented, examined, photographed and measured. All hands were on deck for this painstaking process. Each historic piece was wrapped in a wet paper-towel material, followed by plastic-wrap, then a layer of foam padding. Over 1.5 miles of foam padding were used to protect the precious cargo. When completed, the floor of the storage facility seemed to be covered with Egyptian mummies of all shapes and sizes. TAMU will spend an extensive time documenting each piece of timber, creating a laser scanned image of each beam that can be used for further research. “We hope to learn about the ship’s construction methods and original size and appearance”, said Dr. Eleanor Breen, the acting City Archaeologist working on the project. TAMU will conduct a 2-step restoration process. Initially, the water will be slowly replaced with polyethylene glycol (PEG) to stabilize and strengthen the delicate planks. Finally, a freeze-drying procedure will remove any remaining moisture. It may be 5 to 6 years before the ship’s homecoming, but the work for its return has already begun. “The ship is poised to be the anchor for a new waterfront historical interpretation of Alexandria’s maritime heritage,” claims Breen. The display is destined to be a figurehead of Alexandria’s maritime history. To learn more about the ship and its restoration adventures, follow the Alexandria Archaeology Museum on Twitter at @AlexArchaeology or the hashtag #SaveOurShipALX. A Save Our Ship Fundraiser has been established to preserve this precious piece of history for future generations. When residents of the Washington metropolitan area turn on their taps, potable water comes out. That it is a largely thoughtless practice is a testament to decades of careful planning and cooperation among area water suppliers assisted by the Interstate Commission on the Potomac River Basin (ICPRB). 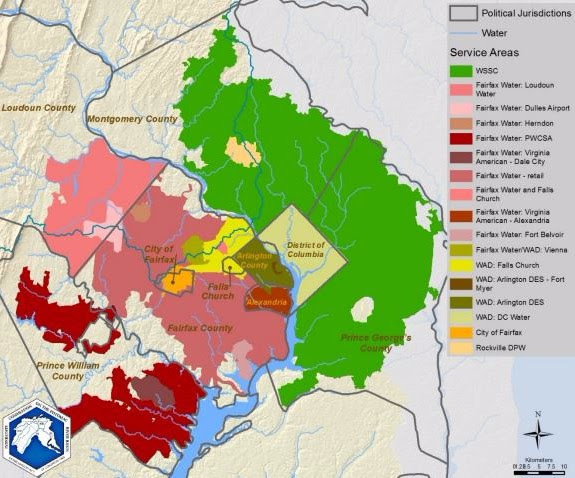 The commission’s Section for Cooperative Water Supply Operations on the Potomac River (CO-OP) studies water use in the region, organizes coordinated utility operations during extreme droughts, and assesses the reliability of current and future raw water supplies. The ICPRB also helps basin water suppliers protect the region’s drinking water sources. A new CO-OP study is proposing a range of solutions to increase the capacity of the region’s water supply, which could fail to meet unrestricted demands by 2040. In this case, there would be a small probability of failure if no action is taken to reduce water use during an extreme drought. The study, “Washington Metropolitan Area Water Supply Alternatives,” also provides information on options for a reliable water supply out to 2085. Alternatives have been evaluated according to their capabilities to increase future system reliability in the face of growing metropolitan area demands, decreasing river flows due to upstream consumptive use, and the potential impacts of climate change. The options for augmenting future supply are both structural and operational. Many have been the subject of past investigations by metropolitan area water suppliers. Although most of the structural alternatives (for example, conversion of stone quarries to store water from the Potomac) would provide water directly to only one or two suppliers, all would provide regional benefits by reducing Potomac River withdrawals during times of low flow. All structural alternatives would require significant investments in new infrastructure including new underground conduits to transfer raw and/or treated water from one part of the supply system to another. The operational alternatives would require little or no infrastructure investment. They would instead require new cooperative agreements, and/or contracts between water suppliers, and/or investment in research to develop new operational tools and policies. In general, the study found that combinations of structural and operational alternatives should be in place to ensure system reliability in the future. For the medium-term planning horizon of 2040, two strategies for phased implementation of quarries and operational enhancements were recommended for further refinement. These two combinations of alternatives were selected in part to ensure system reliability under a moderately severe climate scenario with a 7 percent decrease in average summer stream flows. The strategies also consider the need for steps toward broader regional cooperation to help prepare for more severe challenges that may occur in the decades after 2040. Over the longer-term planning horizon, by 2085, study results indicate that most of the proposed alternatives will be needed to ensure future reliability. “This is the next step in keeping the area’s water supply able to meet the demands of residents,” said ICPRB Executive Director Carlton Haywood. “The region’s water supply will maintain its very high level of reliability with proactive planning and actions by the water providers and governments. This level of planning, cooperation, and execution is why we are looked upon as an example by other regions,” Haywood said. American shad and striped bass stocks had good spawns in the Potomac during 2017. Maryland’s annual young-of-the-year survey consists of seine net hauls at 22 locations around the Maryland portion of the Chesapeake Bay to gauge how many fish were hatched after the springtime spawn. The survey is an important tool in measuring the health of Chesapeake Bay and tidal river fisheries. This year’s survey showed encouraging numbers for both striped bass and American shad. Many areas of the bay contributed to the striped bass number, while American shad reproduction came almost entirely from the Potomac. Overall, bay-wide numbers for both the species were improved over a poor 2016. Maryland Department of Natural Resources Fisheries Biologist and manager of the young-of-year survey Eric Durrell noted that spring weather conditions, including river flow, water temperature, and other factors heavily influence the success of migratory fish species such as the striped bass and shad. The fish time their runs upriver based on these conditions, which give the eggs and larvae the best environmental conditions for success. Striped bass in the Potomac were near the long-term average. 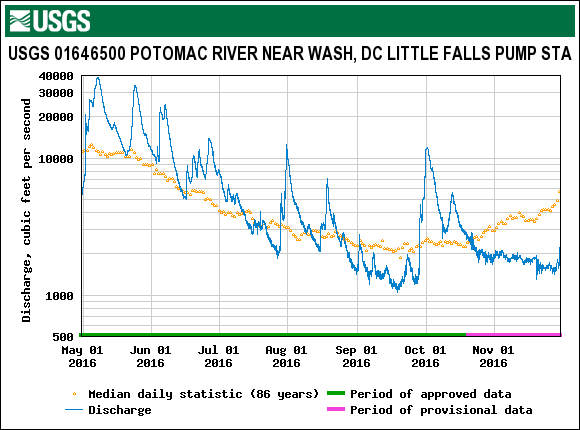 American shad were well above the long-term average on the Potomac, and should help buoy stocks after a phenomenal 2015 Year Class. The same could not be said for the rest of the bay, where reproduction was minimal. “We caught 1,093 American shad during the survey,” Durrell said, “And 1,004 of those fish came from the Potomac.” He noted that the river has historically spawned a lot of shad and that the modifications of Little Falls Dam restored miles of historical spawning and nursery habitat for the fish. In the upper bay, The Susquehanna has several dams that limit the kind of habitat the fish needs, Durrell said. 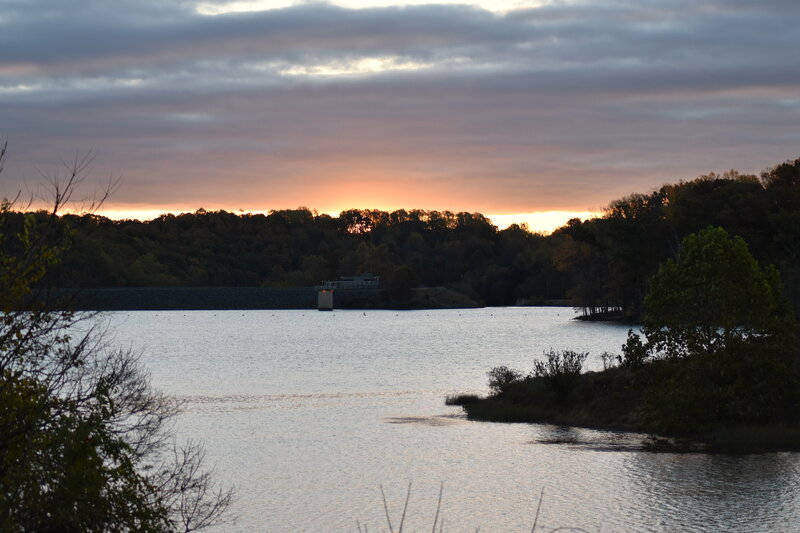 The Potomac has benefitted from an ICPRB organized coalition of government agencies, nonprofits, schools, and teachers who played a role in aggressively stocking the river for about 10 years and pushed for the modifications to the dam that reopened about 10 miles of the fishes’ habitat. The project is one of the success stories of the Chesapeake Bay cleanup. Read more about the project online. American shad reproduction has not been going well on the James and Rappahannock rivers in Virginia, despite a multi-year stocking effort that has, at times, used eggs taken from Potomac fish. A lack of progress toward goals and budget considerations have curtailed the stocking efforts on those rivers. More information on the juvenile striped bass program and the more than 100 species of fish that are seen during the effort is available online. For many people, a boat trip or walk along the shores of the metropolitan Potomac includes seeing a lot of aquatic plants (as well as some algae). Many sections of the Potomac support lush grass beds during the warm months. 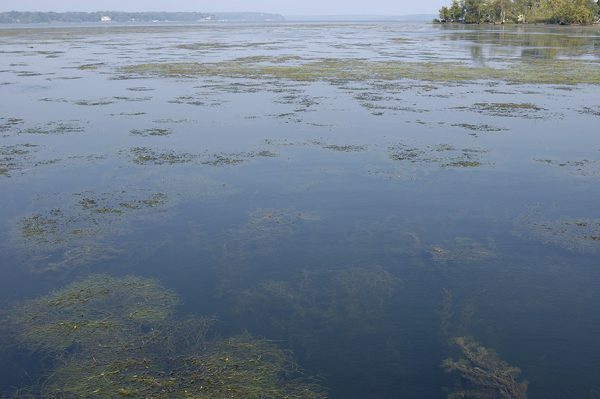 This has not always been the case, and the growth of submerged aquatic vegetation (SAV) has both signaled and been a major factor in the improved water quality of the river. 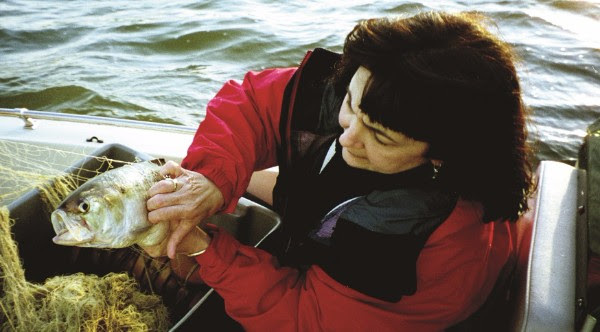 The resurgence of many species of SAV during the last four decades points to the river’s revitalization, noted Nancy Rybicki, a U.S, Geological Survey scientist who has monitored Potomac aquatic plant growth during that time. Rybicki periodically updates groups about the river’s plant status, as she did recently at a meeting of the Friends of Dyke Marsh. The packed room was given a history lesson, as well as warnings about water chestnut, an aquatic plant that once crowded the river downstream of Washington, then was eradicated, and has recently reestablished. Rybicki’s focus over the years has been the upper tidal Potomac. The lower Potomac has not fared as well. The saltier lower river still suffers from water clarity and low dissolved oxygen issues, and is more strongly affected by Chesapeake Bay water quality issues. 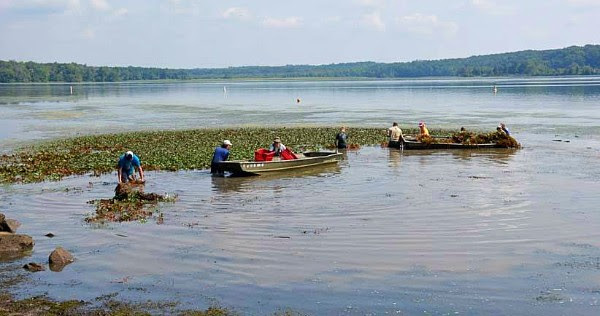 The Potomac’s plant populations declined significantly from nutrient and sediment pollution and accompanying algal blooms through the 1930s but massive water chestnut stands downstream of Washington remained. 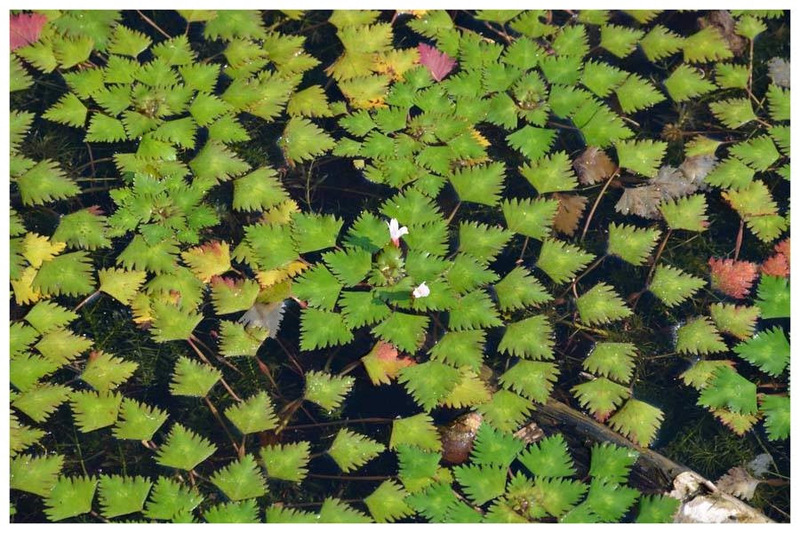 Unlike other aquatic plants, the rooted water chestnut lives on the water’s surface where it can get the sunlight it needed to flourish, despite the sediment and pollution. By 1933, 10,000 acres of dense water chestnut beds clogged the river from Washington, D.C. to Quantico, Va. The growth was finally controlled by a multi-year harvesting and eradication effort by the U.S. Army Corps of Engineers that ended in 1945. Removal by hand continued until at least 1965. Sewage treatment has improved greatly beginning in the 1970s, resulting in some water quality improvements. About 1983, some vegetation returned to the metropolitan river. 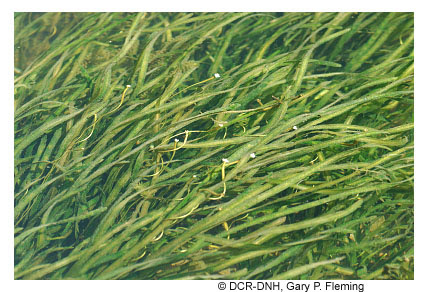 Monitoring revealed that the plants were hydrilla, a non-native plant often mistaken for the resident plant elodea. 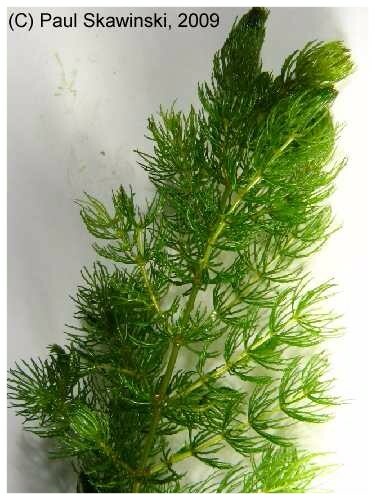 They can be distinguished by the number of leaves that encircle the stem―elodea has 3 leaves while hydrilla has 4-5 leaves per whorl, giving the plant a bushier look. Based on hydrilla management schemes in Florida, which was spending millions of dollars a year, the ICPRB brought groups together to assess the issue. Eventually, an intergovernmental group started mechanically harvesting the plants in areas with high boat traffic. 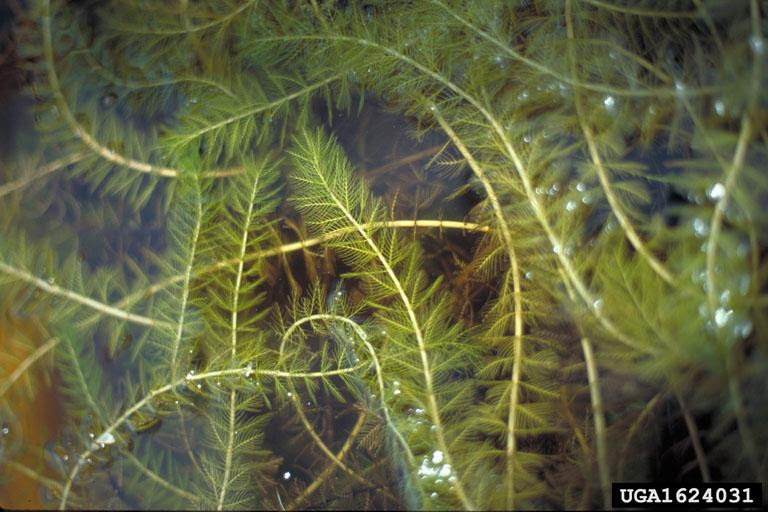 Although not a native plant, hydrilla stands helped improve water clarity, and hydrilla was followed by a number of other, native, aquatic plants that returned to the river. 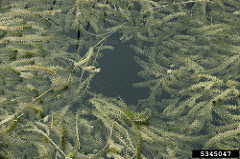 Hydrilla remains the most common plant, but now shares the river with about 20 other species of plants. Learn to distinguish some of the most common species in the article below. 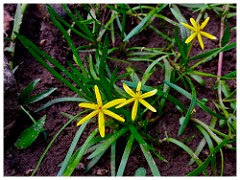 Both the amounts and diversity of aquatic plants increased 10-fold from 1990 to 2007, and continues to increase, Rybicki noted. The growth of Potomac plant populations in a fragile but improving Potomac during that time has been uneven, with weather conditions in any given year (stormy springs with reduced sunlight, high flows that scour the river bottom, cooler temperatures, and other factors) promoting or reducing plant growth. The growth of aquatic plants in the Potomac has helped improve water quality, helping make the river habitable to more plants, as well as providing food, cover, and water clarity that supports more fish and other creatures in the Potomac ecosystem. Water chestnut (Trapa Natans): has only recently become an issue on the Potomac, but may be spreading from stormwater ponds into the river. If you see it, report it! See the article above for more information. We were impressed with the results! There are a lot of Potomac River experts out there. 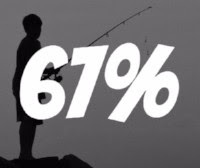 We thought the questions would be difficult, but the average quiz-taker answered 67% of the questions correctly. It’s not too late to take the quiz! Click here to take it before reading further. Then come back here to compare your results. The most correctly answered question asked to identify how many jurisdictions the Potomac River spans. A whopping 86% of you chose the correct answer of four states (Maryland, Virginia, West Virginia, Pennsylvania) and the District of Columbia. The most difficult question, with only 46% of people answering correctly, was the average number of gallons withdrawn from the Potomac River each day. This includes irrigation, agriculture, residential and all other uses. This number spikes in the hottest months of the summer, but the average daily withdrawal from the Potomac is 486 million gallons, or 736 Olympic sized pools. Festival del Rio (Bladensburg, Md.) – This multi-cultural, bilingual event is designed to give Latinos an opportunity to learn about local environmental issues. Jones Point Park Event (Alexandria, Va.) – 75 fourth-graders enjoyed a day of outdoor environmental education at this Every Kid in a Park event. West Va. Science Teachers Association Conference (Wheeling, W.Va.) – ICPRB staff shared our m any educator resources with West Virginia science teachers. 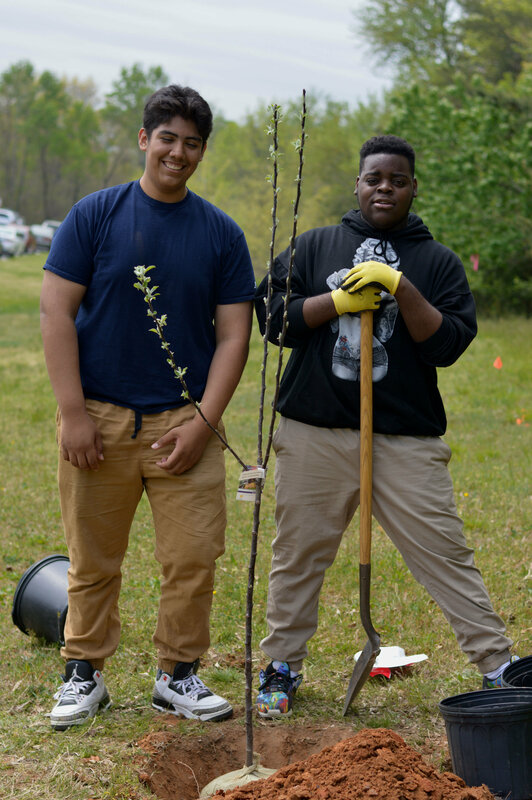 As part of ICPRB’s Score Four program, the high school students celebrated the Conservation Garden installation at Northwestern High School in Hyattsville, Md. 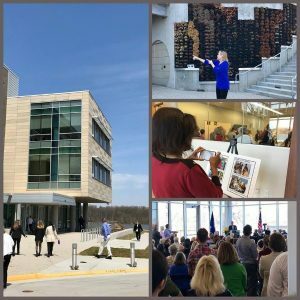 Watch the sign dedication ceremony on Facebook. Bilingual Educator Resources – Bilingual lessons are available in English and Spanish for ICPRB educational programs. Washington Metropolitan Area Water Supply Alternatives – This study assesses a range of solutions to increase the capacity of the region’s water supply, which could fail to meet unrestricted demands by 2040. 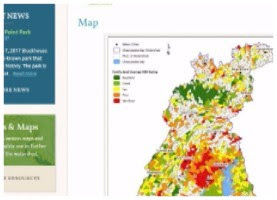 Water Quality Trends – an online visualization tool to quality assure water quality data, allowing one to quickly evaluate trends using various parameters. Chessie BIBI – a multi-metric index of stream health applicable to freshwater streams and small rivers across the Chesapeake Bay watershed. 2016 Drought Exercise Report – For over two decades, ICPRB’s CO-OP has been conducting annual drought exercises for the Washington Metropolitan area. 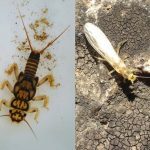 Watershed Activities to Encourage Restoration – simple, low-cost projects that your organization can use to help protect and restore your watershed. Calendar of Events – Fun events in the watershed! 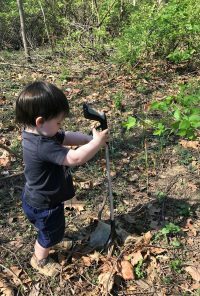 The Next Generation Brings Watershed Stewardship to Campus! Welcome to the Potomac Basin Reporter. On behalf of the ICPRB Commissioners and staff, I wish you a happy New Year, and pledge that the Commission, in partnership with the basin states and our many agency partners will spend 2017 working for a healthier Potomac basin. We begin this New Year by reinstituting the Commission’s newsletter, the Potomac Basin Reporter, distributed electronically to save money and trees. The Reporter, published quarterly, will join the Potomac News Reservoir, social media pages, and our website in keeping basin stakeholders informed about Potomac basin water quality and resources issues and how ICPRB and other agencies are working to protect the river’s values. In addition, the Reporter will include stories about the places, people, and activities that make the basin’s waterways an important part of residents’ lives. We also will publish updates on the river’s flow and how it changes seasonally and annually, as well as other features. The Reporter will afford us a chance to provide lengthier, more-complete articles on subjects affecting the basin’s water quality, quantity, and resources. It also will allow opportunities to encourage the public stewardship needed to ensure the basin’s resources for future generations. We are excited to begin this effort to create a more informed and involved community focused on preserving and improving the health of the Potomac River and its many uses. We welcome comments and criticism that will help make this effort useful and valuable to the basin’s residents. We look forward to hearing from you. Let’s play a game called “Guess the Weird River Resident”. Here are your clues: There are 1700 species and they are found on all continents except Antarctica. They look like a tiny version of a creature that would chase you through the woods in Jurassic Park. Stream monitors love to find them as they are a sign the stream is clean, cool and has high dissolved oxygen. The males of the species start a tiny jam band to attract the females. Have you guessed the river resident? ICPRB’s Score Four Program makes headway in Prince George’s County, Maryland. Maryland has more than 10,000 miles of rivers and streams—spanning from the Appalachians to the Eastern Shore—each being of vital importance to the Chesapeake Bay. Our treasured waterways range from small, unnamed creeks in our neighborhoods to the grand Potomac River. They serve as habitats for species that are important to maintaining a healthy ecosystem and provide essential natural services to our environment. We depend on our waterways to help grow our crops, feed our reservoirs, and provide food, drinking water, and recreational activities. The value they provide is of great importance. It is imperative that we keep our streams healthy because the water, life, and pollutants in them eventually flow into larger rivers and the Chesapeake Bay. The quality of the Bay is dependent upon the quality of our streams. Unfortunately, only 20 percent of Maryland streams meet the criteria for “good” condition. Most streams have eroded stream banks, are polluted and filled with sediment and litter, and lack an abundance of wildlife. With 80 percent of our streams in poor or fair condition, we should all work to protect them and to improve their water quality. This past school year, students in Prince George’s County, Md. did just that. 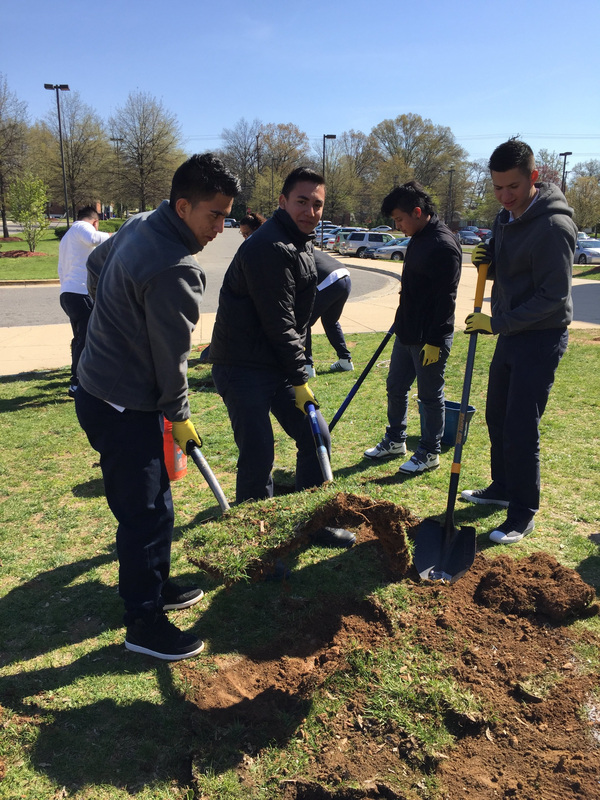 More than 400 students removed approximately 700 square feet of turf grass and replaced it with gardens containing more than 200 native trees and plants that increase infiltration and absorption of runoff, reducing the amount of pollution that enters their local streams. 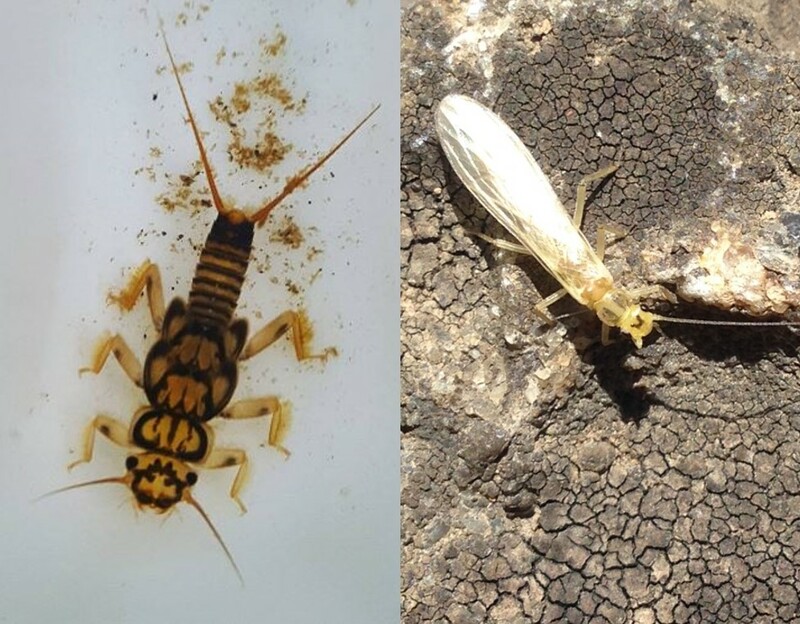 During the 2015-2016 school year, three Prince George’s County public high schools participated in ICPRB’s Score Four: Students, Schools, Streams, and the Bay program, led by ICPRB educators Rebecca Wolf and Nguyen Le. These schools included the Academy of Health Sciences at Prince George’s Community College in Largo, Northwestern High School in Hyattsville, and Parkdale High School in Riverdale. The Score Four program leads students through the process of exploring their watershed and assessing their school campus in order to develop a Stormwater Action Project aimed at reducing stormwater pollution to local streams. Students began the year exploring their watershed by researching their local stream and learning about stormwater pollution sources and reduction methods. They were excited to discover that their local stream was within walking distance of campus and learned what they could do to improve its quality. During their research, they learned about the negative correlation between impervious surfaces and stream quality; the higher the amount of impervious surfaces, the lower the stream quality. Impervious surfaces do not allow water to infiltrate into the ground. Stormwater runs directly into storm drains, carrying trash and other pollutants into the stream or river, eventually making its way to Chesapeake Bay. In the next phase of the program, the students assessed their campus by performing scientific inquiries to determine how their campus contributes to stormwater pollution. These inquiries helped students understand key concepts related to stormwater issues on their campus that would assist them in developing their project. They conducted a campus assessment to identify stormwater paths, problem areas, and possible locations for their project. They also investigated the permeability of the school grounds, as well as soil percolation and composition. With this data, the students determined their secondary project goals and project site, then selected native plants and created a design for their garden. Through this process, the students were able to tailor a project to their individual school campus. At the Academy of Health Sciences, social studies teacher Carmen Wright and biology teacher Apollo Cordon, envisioned installing a conservation landscape on campus. A conservation landscape reduces stormwater runoff while beautifying the campus and attracting wildlife, such as beneficial insects and butterflies. After performing research, collecting data, and selecting plants, the students used their creativity and math skills to develop potential designs for their garden. Teams of students created 30 potential designs. The students presented their designs to their classmates and used a scoring rubric to judge each design, with the highest scoring design from each class entered into a design contest. Students then voted for the winning design. The final design for their garden centered on an eastern redbud tree as the focal point surrounded by butterfly milkweeds, New England asters, black-eyed Susans, and Joe-Pye weeds, totaling more than 60 plants. Bright orange blooms of butterfly milkweeds with plentiful monarch butterfly caterpillars greeted the students upon their return this fall. Kari Rowe, an ESOL (English for Speakers of Other Languages) teacher from Northwestern High School, also envisioned a conservation landscape on campus. In the beginning of the program, it was difficult for the students to fully understand the concepts. However, despite the language barrier, the program was able to be adapted with guidance from Ms. Rowe. By the end, the students displayed their understanding and confidence through the success of their garden. The students designed the garden in a classic “bean” shape, planting more than 60 shrubs and perennials. The garden transformed the area with beautiful blooms of blazing stars, black-eyed Susans, and vibrant purple berries on their beautyberry bush. Environmental science teacher Malka Ostchega had different visions for her students at Parkdale High School. She envisioned installing the beginnings of a food forest on campus that would continually develop throughout the years. Her students researched edible native plants that would meet their site conditions. They planted more than 70 trees and shrubs, ranging from persimmon trees to blackberry bushes to blueberry bushes, on a large hill near the entrance of the school. By selecting to plant on the hill, the food forest is optimally placed to reduce runoff. At the conclusion of the program, the students celebrated their efforts and their gardens, taking great pride in what they accomplished. One student described how she valued implementing a project to address the problem of stormwater pollution instead of just vaguely talking about how we can help the environment. 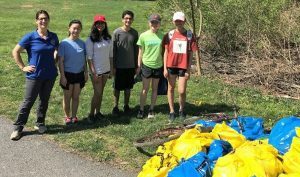 The students became environmentally knowledgeable and felt driven to continue to make a difference in protecting the valuable assets of Maryland’s landscape. The success of this program was dependent on the cooperation, hard work, and dedication of the students, teachers, partners, and sponsors. Thank you to the Prince George’s County Department of the Environment and Chesapeake Bay Trust for providing funding through the Prince George’s County Stormwater Stewardship grant program. You can watch a VIDEO on the Parkdale High School students journey through the Score Four program. Over the years, the Interstate Commission on the Potomac River Basin (ICPRB) has been involved in helping the Potomac jurisdictions in creating water resources plans and policies that attempt to meet the demands of the many users of water resources in the basin. Drinking water supply, wastewater treatment, recreation, industrial use, cooling water for power plants, and other uses are all important to the region’s quality of life. These uses sometimes conflict with consequences for water availability and water quality. Each jurisdiction has a resources plan that addresses issues within its boundaries, but they are not meant to consider the collective impacts on the entire watershed. This can cause conflicts between jurisdictions and degrade the overall quality and quantity of the basin’s shared water resources. The ICPRB is building on its previous work with the jurisdictions, water suppliers, federal agencies, and other basin stakeholders to create a Potomac basin comprehensive water resources plan. The plan also will be adaptive so that changes can be incorporated based on what is learned through existing policies and new research. The plan should be completed in 2018. The Potomac jurisdictions’ plans all have concerns in common. Those commonalities served as a starting point to identify issues for a basin-wide plan that builds on the similarities and seeks to address areas that are of basin-wide or interstate significance. In this way, a basin comprehensive plan can assist the jurisdictions in acknowledging their shared resources and guide them in strengthening their plans. Assessing the facets of existing plans and the challenges that each jurisdiction faces was an important first step. That initial effort is being reviewed by a newly created advisory committee consisting of a wide range of stakeholders from all parts of the basin. This group will assist during each phase of the plan’s development. Their input will help guide an assessment of the basin’s water resources challenges, identification of practical, implementable solutions, preparation of a plan document, and review and revision of the plan for successful implementation. More than 47 challenges in 10 topic areas were identified, including climate change, ecological health, floods/droughts, land use change, and source water protection. Many other stakeholders, while not on the committee, will receive regular updates and requests for feedback via an email distribution list. These two groups will provide diverse perspectives that can guide the developing plan. Currently, the advisory committee has 23 members, with another 130 on the email distribution list. The advisory committee held its introductory meeting in September, guided by a facilitation team hired for the project, Policy Works LLC. Facilitator Kristin Rowles ran through the project timeline, and stressed that the plan was focused on seeking consensus where possible, and that reporting on different perspectives will be crucial. 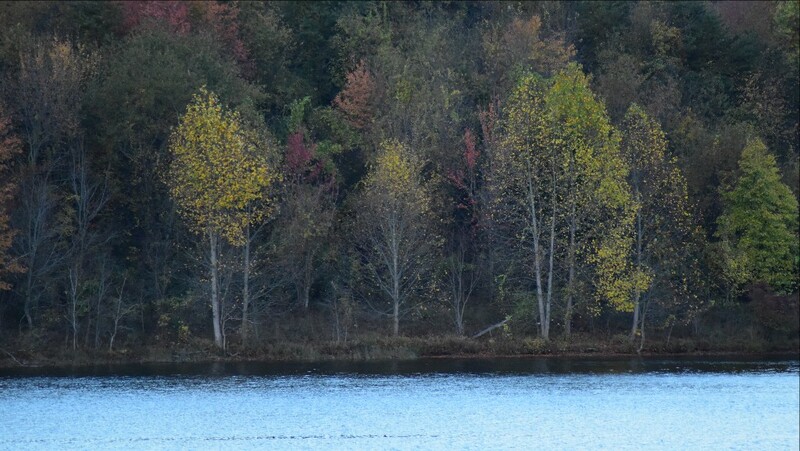 Little Seneca Reservoir holds several wetlands, trails, and other amenities. It is a good example of the many things for which we rely on the Potomac and its resources. The committee also discussed some stakeholder interest areas that should be better represented, and added additional areas of concern that should be addressed by the plan. The committee also reviewed their initial input into a project vision statement and broke into small groups to identify a vision of desired conditions in 50 years and the role the comprehensive plan can play in meeting those goals. The process is off to a good start, with an energized advisory committee and a general agreement that this planning process can provide valuable assistance for the region’s waters in sustainably meeting the many current and future demands on the resource. With the assistance of the stakeholders, ICPRB is now in the process of finalizing the list of challenges and beginning to develop recommendations to be refined by the stakeholders groups. The plan document will then be written and reviewed. How the plan will finally be used will largely be up to the jurisdictions and agencies of the watershed, which can benefit from a basin-focused plan that identifies common problems and solutions, as well as reducing the chance for interstate resources conflicts. Unlike many studies that do little more than collect dust on a shelf, the basin comprehensive plan has from its inception been designed to be inclusive and transparent. Its potential users have been a part of the process, and will more likely be motivated to use the recommendations that they helped develop. “The comprehensive plan will serve as a roadmap to a sustainable future,” said ICPRB Executive Director Carlton Haywood. “Handing healthy, useful rivers and streams to future generations is one of the highest callings of the Commission,” he said. Want to learn more or be added to the email distribution list? Visit our website, or contact us with additional questions. When it comes to learning about local environmental issues it is important that everybody has a seat at the table (or on the boat). That was the thought behind the recent Festival del Río Anacostia held on October 15, 2016, at Bladensburg Waterfront Park in Bladensburg, Md. 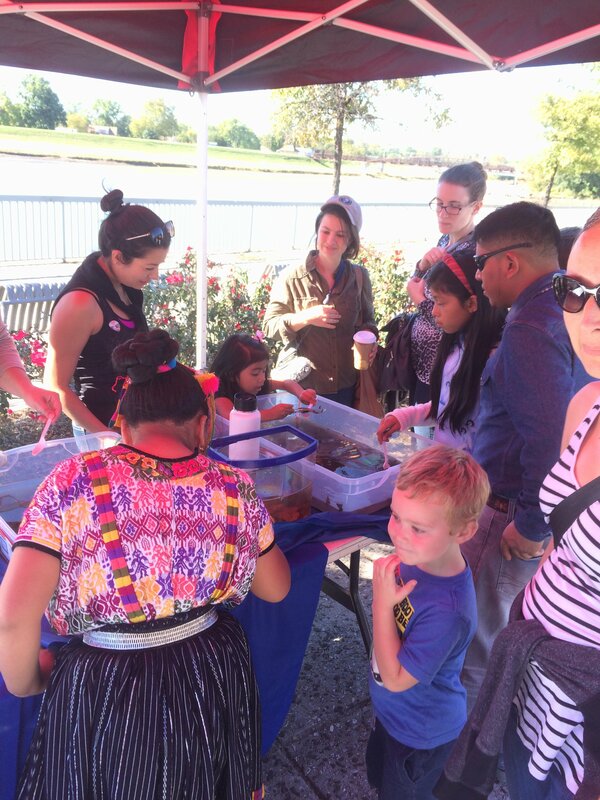 The riverfest with a Latin twist brought 200-300 watershed residents to the park, where local watershed groups, including the Interstate Commission on the Potomac River Basin, discussed river health, pollution, fishing, and more with the largely Spanish-speaking attendees. “The Festival organizers wanted a fun environmental event that would be language- and family-friendly for the many Latino residents of the Anacostia watershed. Our overall goals were to inform Latino communities of environmental issues that affect their lives, of outdoor recreation opportunities, and to involve them in the protection of the watershed,” noted Rebecca Wolf of the Interstate Commission on the Potomac River Basin, one of the organizers of the event. Dedicated to connecting the Latin community to the Anacostia, each organization had a Spanish-speaking attendant to help with translations and explanations. Free fishing lessons and boat-rides let people experience the sights, sounds, and smells of the river. Each booth had an activity for the young attendees, Marimba dancers entertained the crowd, and many enjoyed tacos and pupusas while perusing the booths. It is no secret that the Anacostia River has struggled with the effects of urbanization. 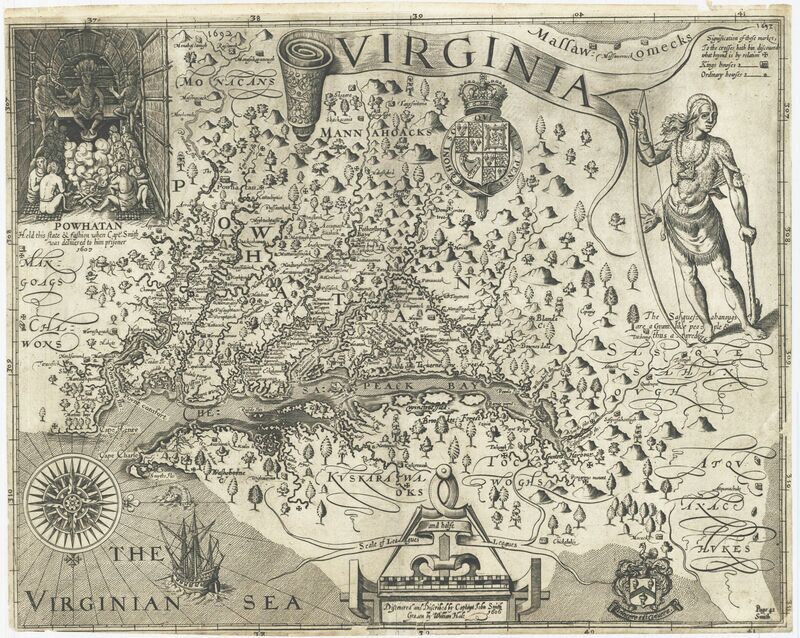 It is one of the most densely populated watersheds within the Chesapeake Bay region. The high population upstream has contributed to stormwater runoff, trash, and other pollutants in the waterway east of the Nation’s Capital. However, recent years have seen much improvement. Local non-profits and government organizations have worked to increase aquatic vegetation, clean up trash, and institute other restoration efforts as well as increase recreation opportunities for those that live within its watershed. The first annual event was declared a success by all. Mark your calendars for Festival del Río Anacostia, 2017 on October 15. “After the success of this year’s pilot festival, the event organizers plan for a bigger festival next year,” said Wolf. ICPRB would like to thank all the organizations and the volunteers that made the Festival del Río Anacostia a success. The Potomac has always been known as a “flashy” river, with high and low river flows that sometimes are only a few days apart. It earned its title this spring and summer. There was plenty of precipitation during the summer, although the region did not get the massive storms that cause serious flooding. 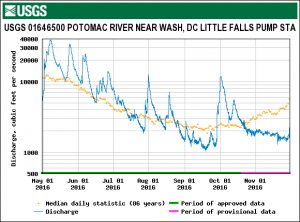 From March through October, the highest daily flow measured at Little Falls gage (which captures flow in the basin upstream of Washington, D.C.) was about 20.9 billion gallons per day on May 8, 2016. 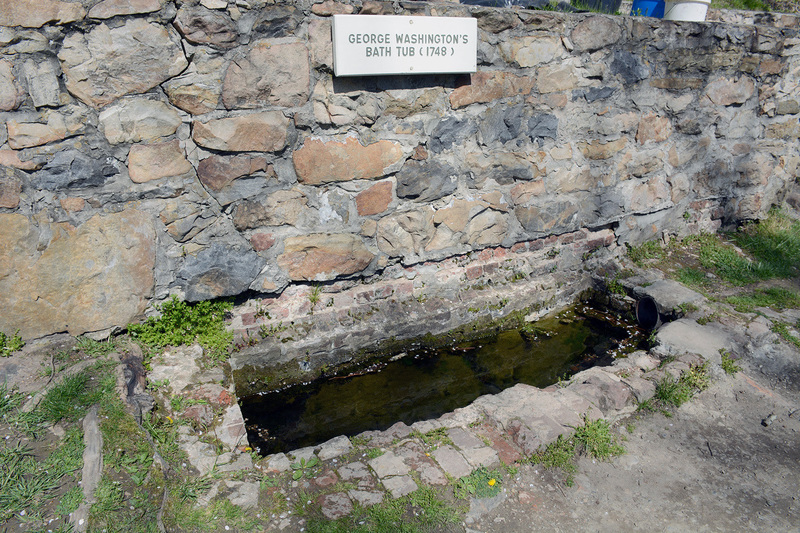 The gage recorded a low of about 565 million gallons per day on September 19. Average annual flow of the river is about 7 billion gallons per day. Flows are tracked by the U.S. Geological Survey at gage stations around the watershed. During that time, flows rose and fell frequently from May through August.In the tidal Potomac, there were reports of remarkable water clarity in some areas, although the river as a whole looked fairly normal. 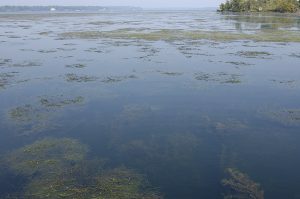 The frequent rains also limited sunlight, and submerged vegetation in the river got off to a very slow start in the spring, but quickly recovered to normal or above-normal levels. The mouth of the Potomac is near the southern end of the annual “dead zone” of low-oxygen (hypoxic) water that infests part of the Chesapeake’s bottom each summer. The Potomac has its own warm-weather hypoxic zone that is present at the mouth and can extend up toward the Route 301 Bridge in bad summers. Like the bay, the lower Potomac’s zone was about normal for the year after bouncing around the median. Bottom dissolved oxygen near the river’s mouth approaches zero in many years. When an extended dry spell gripped the basin in September, river levels fell to a point where the ICPRB Section for Cooperative Water Supply Operation on the Potomac (CO-OP) began daily monitoring of river levels, water supply utility demands and precipitation. The daily status monitoring allows a smooth transition into drought operations, if needed. In a strong drought, CO-OP works with the utilities to guide their use of water sources and to request releases of stored water from the Jennings Randolph Reservoir, more than 100 miles upstream. Daily monitoring occurred during the month of September. River levels rose in early October, but monitoring began again on October 24, and has been ongoing. Water usage drops strongly in the fall (after people stop watering lawns and gardens) and even with continued dry weather the probability of a water release is very small. ICPRB’s Score Four Program makes headway in Prince George’s County, Md. At the Academy of Health Sciences, social studies teacher Carmen Wright and biology teacher Apollo Cordon, envisioned installling a conservation landscape on campus. A conservation landscape reduces stormwater runoff while beautifying the campus and attracting wildlife, such as beneficial insects and butterflies. After performing research, collecting data, and selecting plants, the students used their creativity and math skills to develop potential designs for their garden. Teams of students created 30 potential designs. The students presented their designs to their classmates and used a scoring rubric to judge each design, with the highest scoring design from each class entered into a design contest. Students then voted for the winning design. The final design for their garden centered on an eastern redbud tree as the focal point surrounded by butterfly milkweeds, New England asters, black-eyed Susans, and Joe-Pye weeds, totaling more than 60 plants. Bright orange blooms of butterfly milkweeds with plentiful monarch butterfly caterpillars greeted the students upon their return this fall.